Join us Sunday, December 9 from 1 - 4 pm for a winter pop-up sale at Rachel’s place, 1224 E Cooke Rd Columbus OH 43224. Sunday, July 16 l 1-4 p.m.
Buy seedlings direct from the farm while enjoying a peek at herb rows, conservation plantings, and our hoop house. The Foraged & Sown garden at 1264 Elmore will be open for perusal on Sunday August 6 from 11 am - 2 pm. See what the mid-summer rows look like and browse our cut herbs and berries available for purchase. Admission is free, kids welcome, drop in! It's time for our annual open house, and this year we'll be at Rachel's Harmonious Homestead 1224 E Cooke location. 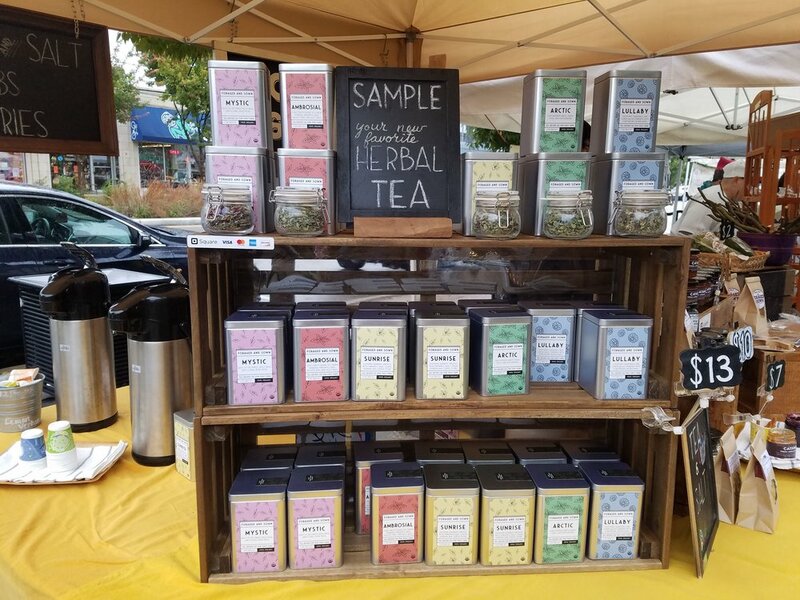 Come on by between 1 and 4 to see how the fields are continuing to change and sample some of our herbal teas and other treats. For more information, visit the Facebook event page by clicking here. Stop by Foraged & Sown's herb and berry rows at Rachel's Harmonious Homestead - 1224 E Cooke Rd - for a pop-up farm stand on Sunday July 2 from 11 am - 2 pm. We'll have a tea or soda sample to share and fresh cut herbs and produce for purchase. We'll set up shady seating for folks who want to stay and visit too. Free admission, kid friendly, drop in! RSVP or share the Facebook event if you please. Join us for a spring garden open house at Kate's (1264 Elmore Rd) on Sunday June 4 from 11 am - 2 pm. We'll offer a tea or soda sample, fresh cut herbs, opportunity to see our summer plantings and quail, and deep discounts on whatever seedlings remain. Admission is free, kids are welcome, drop in! Invite your friends or RSVP at the Facebook event.